Thank you for all your kind words and gifts. I have really enjoyed working with them this and wish them all the best for next year. We had a fun day for our seaside day. We carried out a range of seaside activities including paddling, fishing and playing in sand. We then had visit off Punch and Judy which was thoroughly enjoyed by everyone before ending the day with more games, a fete planned by Year 3/4 and a visit off the ice-cream van. The children had a really fun afternoon at forest school this week. They were completing measuring activities, a scavenger hunt and finding out which trees were in forest school. With the weather hopefully improving we hope to spend more time in forest school. To celebrate V.E. day we looked at photographs of the war and V.E. day. We listened to some of Winston Churchill's speech and also watched a video of Mrs John's gran telling us about her memories of V.E. day. We sang and listened to songs from the time and did the Hokey Cokey and Conga, as well as tasted some food that they may have had at the V.E. day street party celebrations. To finish the afternoon we joined in a 2 minute silence with the rest of the school to remember those who lost their lives in the war. Well done to all the children for working so hard in their National Tests this week. We are really proud of you. 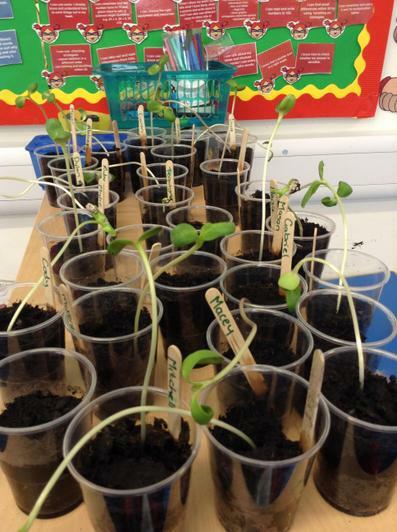 We have been learning about seeds and flowers this half term. We have grown our own sunflowers. 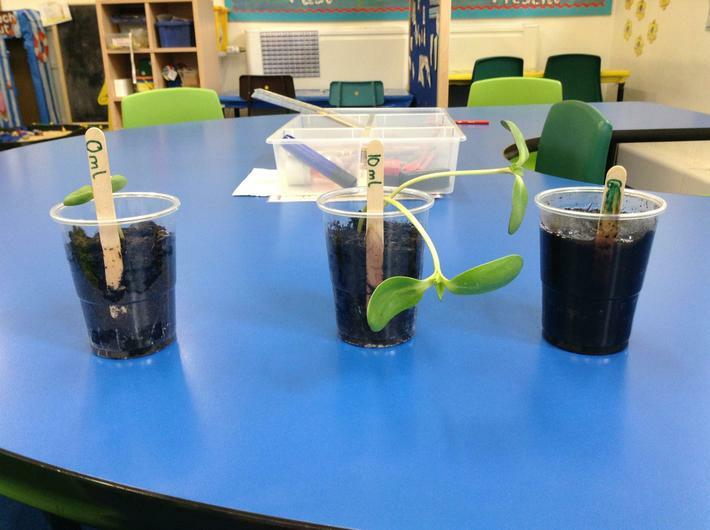 We have also carried out an experiment to find out what seeds need to grow. We found the seed didn't grow in too much water and only grew a little with no water as the soil was damp when we put it in.